Which Travel Point Cards Give You the Most Rewards? Do you want to get on the travel point plane or train? Read this guide and know which travel credit cards give you the most rewards and save you money. You hear it all the time – another friend found a ridiculously cheap flight to Europe and is taking off in a few weeks. Your mom just scored a great hotel stay for her birthday, or your best friend is taking a last minute trip just because he or she can. Where is everyone getting these travel opportunities from?! These things don’t happen purely by chance. In this day and age, the secret to traveling often without breaking the bank is to have a travel point credit card. This doesn’t mean go out and dig yourself into credit card debt. On the contrary, the best way to use your points is to stay on top of your payments and to find the right credit card for your needs. Keep reading for a closer look at how points turn into boarding passes. Before you apply for a travel point card, make sure you’re fully aware of what you’re getting yourself into. Each card will have a unique policy regarding the requirements, bonus point opportunities, and more. But, no matter what you choose, you’re sure to get a sweet deal once you learn how to make your money work for you. Here are three things to keep in mind while looking for a new credit card to use for travel. Take a close look at the signup bonus and the regular rewards points available. Some travel point cards will give you a significant amount of credits if you spend a certain amount of money within a short time of getting your card. Others will match your points 1:1 or even 2:1 for every dollar you spend! It all depends on the terms of each card. Read the fine print carefully and clarify any questions you may have before moving forward. This could be the difference between getting points on every single dollar you spend, versus only earning points for certain types of expenses. Chances are, if you’re using a travel point card, you like to be smart with your money – or at least you’re learning how to be. When you get your card, it’s best to rack up as many points as possible, which means you start using the same card for every little thing. Then, to track your earnings at the end of the month, or to mark deductibles at the end of the year, you can find everything in one place. This makes budgeting and tax filing easier than ever. In addition to all the points you get for flight tickets, a travel point card can do so much more. Think, access to exclusive airport lounges, travel spending bonuses, and even special alerts for cheap flights. These are just a handful of the additional features a travel credit card offers. It’s not always about the ticket that gets you there. It’s about maximizing every part of your journey from point A to point B. So, how are you supposed to access these perks, anyway? With the right card that works for you. There are plenty of travel point credit cards out there. But, instead of stuffing your wallet with all of them, it’s best to start building points on the card you can get the most out of. Below are four of the top travel card choices to consider. Many travel experts recognize the Chase Sapphire Preserve as the ultimate travel tool. It may take you a bit of time to build your credit and get access to this card, but the effort is well worth it. The Sapphire Preserve allows you to earn major bonuses if you play your cards right. 50,000 extra points are up for grabs if you spend $4,000 in 3 months after signing up. You can also get 5,000 other points if you add an authorized user to your accounts. Once the bonus period ends, the points keep racking up easily. You get two points for every dollar spent on travel and dining (i.e. Uber, airport purchases, lunch dates, and even morning coffee stops). Then, for all other expenses, you get one point. Think of all the money you’re planning to spend this month or this year. That’s about how many points you can earn with the Chase Sapphire Preserve. If you don’t have Sapphire access yet, try applying for the Chase Freedom Unlimited. This travel point card is a bit easier to get, and still offers plenty of cool perks. You get 1.5% cash back on every single purchase. Not to mention, a spending of $500 within your first 3 months results in a $150 bonus. It’s not 50,000 travel points, but maybe enough for a last-minute weekend getaway! There’s no annual fee and 0% APR for 15 months. If you’re curious about what points can do, this may be the best card to get you started. To learn more about credit card interest rates and payments in general, check out these offers. Bank of America offers a great Travel Rewards card as an alternative to the Chase options. Anyone who signs up has no annual fees and no foreign transaction fees, either. The latter is a pretty big deal if you’re trying to watch your spendings overseas and don’t want to worry about conversion rates or card swiping fees. More so, you get 1.5 points for every dollar spent, and if you spend $1,000 within the sign-up bonus period, 20,000 points are yours! This card is simple, stress-free, and effective. It can put you on more flights this year than you may expect, as long as you spend wisely. At the end of the day, traveling is all about enjoying yourself. This is your time to get away from daily life and dive into a new, interesting world. 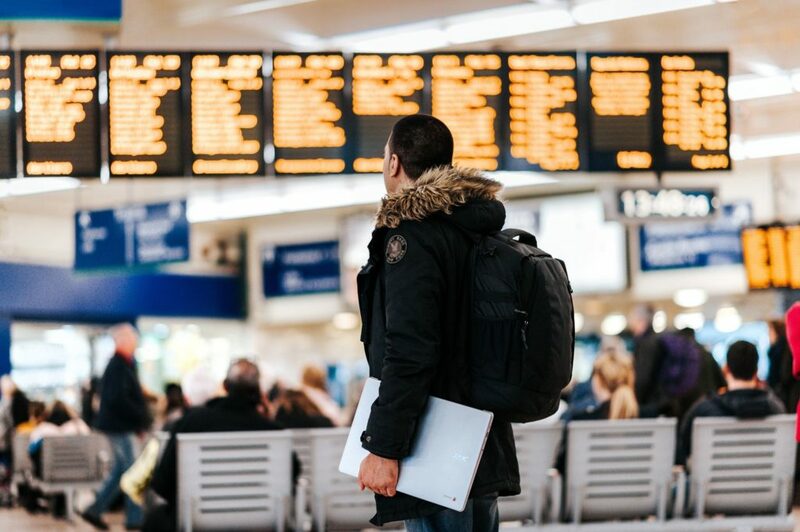 Maybe you use your points to reach the other side of the globe, or at least to make it home for the holidays this year without worrying about finances. Wherever you plan to go, the right card can help get you there. If you need a little bit of travel inspiration or help choosing a destination, click here.